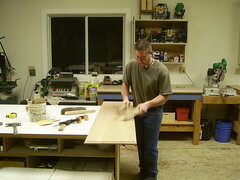 The bench was made to go with an existing dining set. The wood is cherry and it has a distressed finish with worm holes, dings, a dents. The pattern in the apron was templated from the table. Confession time. I did not make the legs. They cost me $50 each from Michael Burak Designs. They are made from cherry and they were perfect. I think the total bill came to $220 with shipping. I could not have made even one leg for the cost of all four legs and so it made good financial sense. If I made the legs myself I would not have sold it for what I would have had to charge. As a contractor I feel no shame in subcontracting work out. The finished bench looks like it was ordered with the original dining set. The stain was a perfect match, it is Sherwin’s BAC Wiping Stain. It dries to topcoat in 30 minutes. The finish is Sherwin’s pre-cat lacquer T77-F37. Looks good to me. Not working for profit I have always made my own legs. It’s my time to spend. I can see you point in buying them though. I certainly never fault anyone for making their own legs. But this was a simple piece and there was no way I could get away with charging enough to pay for my labor of making the legs. It certainly lacks a bit on the fulfillment side when I can’t tackle all of the details myself, but the reality is I have to make money. Nice they look good, but I’m betting a Clippinger designed table leg would have been awesome. nice bench! i like the finish a lot. i don’t see any shame in buying the legs either, you don’t have to so the work and you know that all four legs will match. thanks for the post. I used a scratch awl for the worm holes. I used a wood file for stamping and roughing the edges. A couple of blocks of wood worked for “flogging” the wood. I also used a flat tip screw driver for some gouging. Your perception and understanding of how difficult it is to duplicate a design is a mature observation. It has been fun watching you grow in your knowledge and skill. You will go far with the craft. Very nice looking bench. You did a beautiful job on this piece. Thanks for posting. Nice work again. How did you go about matching the stain? The client allowed me to take a leaf from the table. I went into Sherwin Williams with a scrap piece of cherry and we matched it in about 5 minutes. Yes, I had to be careful to make the worm hole pattern natural looking. The wear marks are fairly easy because logically they occur in certain areas through daily use. Todd your work is always first class. very nice…still waiting for the Clippinger School of Woodworking to open (summer would be good! )...little Montana fishing in the early morning…followed by a first class woodworking the rest of the day? hah? ya ? Of course with your wonderful work you must be very busy! That sounds like a great curriculum. Fishing & woodworking.